Hidd Saadiyat ... 20 per cent of the masterplan allocated to green areas. 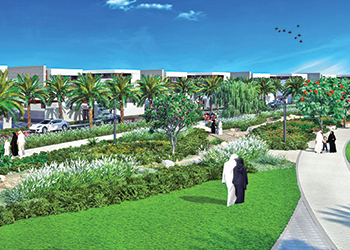 Gulf Contracting Company (GCC) has secured the landscaping contract of Hidd Al Saadiyat, an exclusive beachfront neighbourhood located on Saadiyat Island, the cultural district of the UAE capital. The contract was awarded by Saadiyat Development and Investment Company (SDIC), the developer of the property which comprises nearly 1.5 million sq m of natural beachfront land and 7 km of waterfront providing easy access to the beach from every unit within the development. Hardscaping of the neighbourhoods at the development kicks off this year and will include pavement of driveways, pathways and road signage, benches, light poles, and bollards. This is in addition to underground work activities including irrigation, electricals, manholes and concrete bases for signage. Planting is set to take place in a phased manner working from the beginning of the development towards the end. Hidd Al Saadiyat’s landscape will include interconnected park spaces, children’s play areas, open lawn spaces and shaded seating areas. The development’s open spaces are designed for water conservation, with native plant species, and materials selected specifically for solar reflection. Awarded the Estidama Pearl Two rating for compliance with Abu Dhabi’s sustainability standards of new projects by the Abu Dhabi Urban Planning Council (UPC), the project’s green areas stretch across 20 per cent of the total masterplan. The exclusive villas ... respond to their location. Slingerland says the masterplan development conceives many strategies such as the primary and secondary pedestrian walkways that aim to ease accessibility within the development. These include access to linear and neighbourhood parks, shaded public realm spaces and beachfront as well as the integration of bicycle paths. The project manager of the development is Lead Development. Hidd Al Saadiyat is surrounded by world-class hotels, resorts and museums, offering a perfect blend of community living. “Hidd Al Saadiyat inspires an exclusive lifestyle that combines contemporary, Mediterranean and modern Arabic designs, with an enclave of villas, apartments, an international five-star resort, marina and yacht club, cultural district, and an educational institution,” he says. 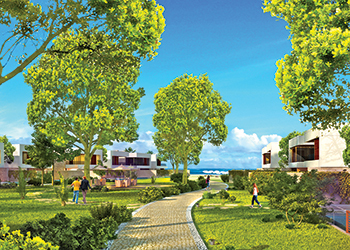 The exclusive 461 villas are designed and developed to harmoniously respond to the unique location and surrounding ocean scape. Initial construction on Hidd Al Saadiyat began in January 2013 and the project handover will begin at end of this year.